Vastese (Vastese: Lu Uâʃtaréule or Lu indialett di lu Uašt, meaning "the dialect of Vasto") is a Romance language spoken in the town of Vasto. It is considered its own language based upon the mutual unintelligibility of it and Italian. It is not spoken by any other town, even the nearby town of Cupello, which is only 9 kilometres (5.6 mi) away. Vastese's endonym- the name its speakers use for the language- is Lu Uâʃtaréule. This term is known to have originated in the sixth century AD. Today Vastese is spoken monolingually only by residents of Vasto in their 80s and 90s, bilingually by many residents in their 70s, and many middle-aged residents are passive speakers, while most younger residents have no comprehension. The Vasto Club in Australia is a club organized for migrants to Australia from Vasto. Vastese has more vowel distinctions than Tuscan, Italy's official and standard language. It has vowels that are not in Italian, such as the open front unrounded vowel /æ/. Vastese uses an open back rounded vowel /ɒ/ for the start of the word uâʃtə. It also uses the mid central vowel /ə/. 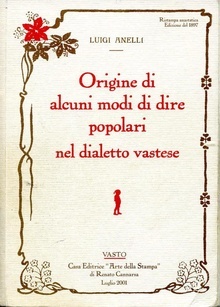 Vastese also uses several diphthongs not used in italian such as /aʊ/, /eʊ/, and /aɪ/. The influence of /i/, /u/, /Ī/, or /Ū/ upon /æ/, turns it into either /e/ or /je/. ^ a b c d "Vastesi Language - Vastesi in the World". Vastesi in the World. Retrieved 20 November 2016. ^ a b Iuliano, Susanna (2010). Vite italiane : Italian lives in Western Australia. Crawley, W.A. : UWA Pub. p. 133. ISBN 9781921401503. ^ Torres-Tamarit, Francesc; van Oostendorp, Marc; Linke,, Kathrin (2016). Approaches to Metaphony in the Languages of Italy. Walter de Gruyter GmbH & Co KG. p. 151. ISBN 9783110366310. This page was last edited on 10 March 2019, at 16:09 (UTC).